"I just think we should see other people." "You're not the person I married in 2008." "You can't blame a boy for wanting to put on his fancy boots and paint the town red once in a while! We can't sit in the basement in our t-shirts eating snack food and wishing the world would slow down forever." "You only hurt the ones you love." "You'll always be my first." "You'll always have a special place in my heart." "Oh, NOW you're listening to me, huh? I see." Why would I do such a thing you ask? So those issues also forced my hand to expand and diversify away from my 99% focus on Infusionsoft. So, after months of speculation, I publicly confirmed the rumors that, yes, I have mostly made the switch to HubSpot from Infusionsoft. I am still certified in Infusionsoft and sell it when it makes sense for the client. I am hopeful that the "New Infusionsoft" will do what they say and I'm happy to sell what works. I am remaining current on Infusionsoft because it is the right choice for a lot of my clients and despite their setbacks, Infusionsoft still does a lot of things right at an affordable price and as of December 2018, I'm actually seeing some encouraging progress, so I remain cautiously optimistic. It's hard to move 10 years of CRM, email marketing, and E-commerce along with 700+ posts, and 200+ webpages and landing pages...but I did it and I'm glad I made the switch when it comes to HubSpot vs. Wordpress. In analyzing the move I looked at it like you, the business-owning entrepreneur, would and I started with costs for each application. But I didn't look at just the listed price, I looked at the TRUE COST of ownership for both applications and included things such as website hosting, blogging & SEO software, direct mail and shopping cart integrations, and more. To make it easier to review I created a Google Sheet and embedded it below. 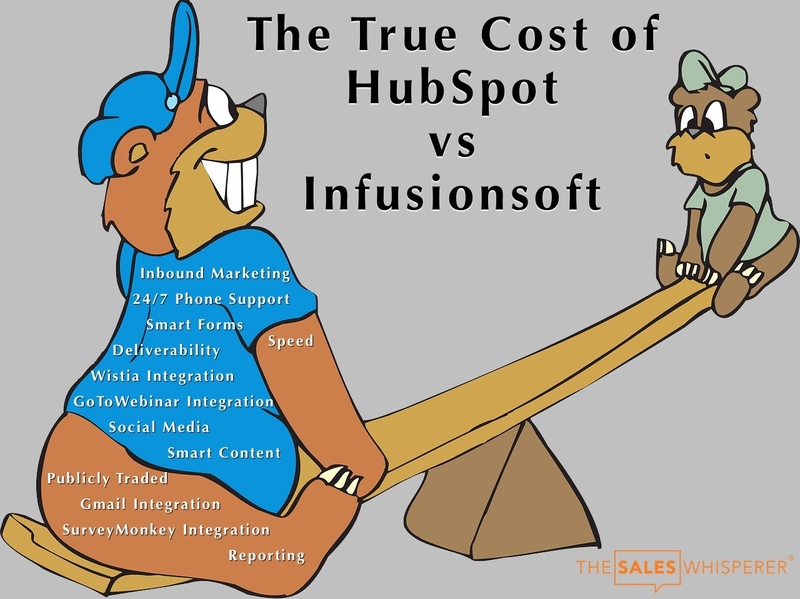 As you can see, if you are a power-user / leading-edge type of user of Infusionsoft, HubSpot may actually cost you less when you take into consideration all of the 3rd party applications you would need to purchase to get the same type of functionality out of Infusionsoft that HubSpot provides natively. As you can see there is much more to this total cost of ownership than just the retail price. If you're like me when I first started out and simply used Infusionsoft the way it was designed without trying to connect it via APIs or other 3rd-party integrations and you're going to use an off-the-shelf Wordpress theme and moderate hosting and are comfortable doing your own content creation via guerilla research and marketing, then Infusionsoft + Wordpress + WP Engine Hosting is fine. That's all I used to build not only a 6-figure business while working from home, I also built a 6-figure recurring revenue business while working from home. But that was 2008 to 2013. Times, technology, and buyers have changed. New CRMs, shopping carts, and marketing automation platforms seem to come out monthly, if not weekly. And the old dogs are not sitting still either. Ontraport came out with their 5.0. ActiveCampaign is performing miracles with a team about 1/5th the size of Infusionsoft. And Nimble is a solid social CRM that can sit on top of most any other platform. So there are more options—and more powerful, flexible, capable options—today than when I got into this in 2008. But the tool is only part of the equation. In much the same way Tiger Woods and I can swap golf bags and he would beat me every day of the week and twice on Sunday, a professional can achieve tremendous results in any given situation with any tools at their disposal. That being said, my father has been in commercial insulation his entire life. He runs projects with upwards of 700 workers and the first thing he asks a new-hire that wants to come on as a journeyman instead of an apprentice is "show me your tools." Professionals know the value of good tools and having the right tool for the job. They understand the ROI of investing in good tools and using them properly. If you only use your CRM or marketing automation tool occasionally you might not even notice if it's "a little sluggish" from "time to time" and it may not even be a big deal. I mean, you don't trade in your car that's paid off for a brand new one and go into debt just because the new car gets 28 mpg and your current car gets 24 mpg. However, if you got a new job that's 30 miles from your home and you're here in California where gas got as high as $5 per gallon, it probably makes sense to trade in the 24 mpg sedan for the 54 mpg Prius. As a user and partner of Infusionsoft since 2008 and HubSpot since 2014 and using them both on a daily basis, I can tell you that HubSpot is faster than Infusionsoft. Much faster. It's so much faster I made the following video to demonstrate it. Below is a spreadsheet I made to help you calculate the impact a "little 7 second time delay" can have on the profitability of your business...and it's amazing. In 2008 when I purchased Infusionsoft they had one setup price: $5,000. And you know what you got for it? Not much. But when you put that kind of money on the line it gets your attention, which we could all get a little better at, if we're being honest. Then Infusionsoft went to $0 down and they sold a lot of software...and cancelled even more. You see back then they didn't have a good on-boarding process so people would get frustrated with how hard the software was so setup so they cancelled. Then Infusionsoft came out with the Campaign Builder and a clear process for on-boarding new clients and brought back a setup fee. It fluctuated between $1,000 and $2,000 and sales grew as people's utilization of the software grew. Whew! Really? Why so confusing and how long will these prices stay? 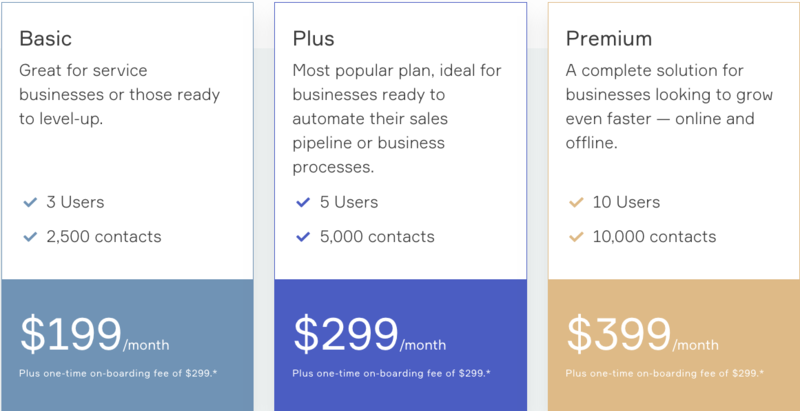 Why is any pricing feature not shown on the Infusionsoft pricing page? As you dig around on the Infusionsoft Pro page you can find some attractive pricing for up to 10 Users. 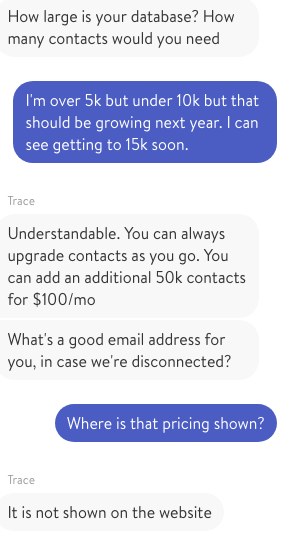 Now my beef with HubSpot is that they are seem to be channeling their inner Salesforce in how they continue to roll out new features and programs and add-ons and their pricing is becoming complex, but at least it is visible. HubSpot is the Cadillac of the inbound marketing space. For most users the Pro package is what you'll need and it's $3,000 down and $800/mo as I listed above. For that $3,000 you get a dedicated on-boarding coach that provides 90 days of support and training to ensure you have a positive experience and achieve a positive ROI quickly. So for $1,000 per month you're getting your own well-trained inbound sales professional to help you understand SEO, Personas, inbound marketing, marketing automation, CRMs, Calls To Action, landing pages, Social Selling, reporting, and more. HubSpot is for people that want the best and will use all of the tools and are focused on content creation, inbound marketing, and willing to commit to spending at least 12 hours per week on the software. So if you were thinking "$3,000 down and $800/mo to buy HubSpot is a lot more than Infusionsoft," maybe it is, maybe it isn't. If you're still wondering which CRM is best for you, please take the free quiz via the link below or contact me to set a time to review your current situation and needs and we'll figure it out together.